Laplace Conseil is a consulting firm for strategic and operational management, specialised in metal and mineral industries, especially iron and steel industry. Marcel Genet founded and managed Laplace Conseil since 1995. Laplace Conseil clients are large global companies, investments funds, private and public financial institutions operating or involved in steel, non-ferrous metals as well as raw materials, iron ore, scrap, alloys, minerals and refractories. 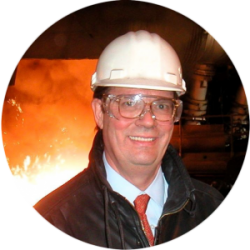 40 years experience in organization and management consulting entirely in metal and mining sectors. A dense global network of partners and correspondents, established over many years, in particular in steel intensive regions and countries, China, India, Europe, CIS, North and South Americas. We have helped several clients develop and implement their strategy for growth, acquisition, geographic expansion and sometimes restructuring. For these projects, we work closely with internal client teams as well as external advisors when necessary (investment banks, auditors, experts) to provide a complete framework from initial opportunity scoping and due diligence, to post merger implementation. Since the mid-eighties, Marcel Genet and his team have refined a particularly effective method - Delta - for engineering fast turnaround in overheads, industrial and commercial operations. Ex-post audits have proven the method’s effectiveness, which rests on management commitment and large client teams. With our unique mix of international partners and dedicated internal consultants, we are able to provide rapid, precise and efficient market analysis for assessing market opportunities. Most of our work in this area is conducted in Asia and particularly in China. Marcel Genet is a recognized expert in several aspects of financial risk management. Laplace Conseil was the first to be selected by the LME to assist in investigating the feasibility of launching Steel Future contracts. These areas are often approached simultaneously, in keeping with our philosophy to offer tailor-made solutions and a global approach of change management through value analysis. Laplace Conseil was founded in February 1995 by Marcel Genet, an international consultant with 15 years of experience as a director at McKinsey & Company where he headed the firm's world-wide steel practice. Since its creation, Laplace Conseil has remained specialized in the metal and mineral industries and has provided distinct and personalized advice to CEO's and senior management, often in anticipation of major strategic moves, alliances or mergers. As a small firm, we strive to tailor our missions to the specific needs of our clients, building on an extensive information base of major industry trends and evolution so as to provide prompt response and flexible support. We also work with a large network of partners around the world, often former McKinsey colleagues, so as to provide a global perspective to solve our clients problems. Laplace Conseil was named in honor of Pierre-Simon de Laplace (1749-1827), French mathematician, astronomer and physician who, among other major achievements, put statistics and probability on a strong theoretical and practical footing. His all encompassing vision of the universe finds an echo in our consulting approach that considers the client's problem from all relevant angles: strategic, financial, commercial, industrial and social. Marcel.genet@laplaceconseil.com ACCES TO LAPLACE CONSEIL OFFICE The office is located next to the Hôpital Américain, 5 minutes from the Porte Maillot and 30 minutes from Roissy-Charles de Gaulle airport. CAR From exterior beltway (Périphérique), exit Porte des Ternes then turn right on boulevard Victor Hugo (toward Neuilly sur Seine). From interior beltway (Périphérique), exit Porte Maillot, continue on boulevard Pershing then, turn left on boulevard Victor Hugo (toward Neuilly sur Seine). SUBWAY Metro: ligne 1, exit station Pont de Neuilly. or a 10 minutes walk along tree lined boulevard du Château.